Home » Auto » Concept Car » F-Vision » Ford » Iron Man » Tony Stark » Trucks » Electric Trucks Ford F-Vision: Inspired by Iron Man? Electric Trucks Ford F-Vision: Inspired by Iron Man? Ford has rarely come to the surface lately, moreover indeed the car brand from the United States has been removed from Indonesia. 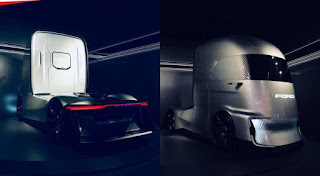 But secretly there is something that Ford has prepared to welcome the public, namely Ford F-Vision, a concept truck introduced at the Hannover Motor Show. Let's discuss it. So the Ford F-Vision Concept is made by Ford Otosan in Turkey, and this truck is an electric truck with a semi-futuristic concept when viewed from some of the front of this truck. These trucks are the same as trucks in general have wheels that are large enough to withstand unusual loads, then coupled with air space surrounded by slimmer LED lights and a sharp design that is very popular today. Ford F-Vision Concept is also equipped with a modern camera rearview mirror which seems to make it easier for users not to forget the door that makes it easy to access the vehicle's cabin. The aerodynamic side of the truck is certainly not kidding, if we realize that it is only part of the total tire because the other parts of the tire are hidden to increase the impression of a more beautiful and magnificent. The design was not half-hearted, not only the cabin that was given a modern impression, but to the modern design cargo section was not overlooked. The conclusion is easy, if this truck is right there will be on the road, it will change the perception of the big box truck which is quite boring. What a surprising concept, because this electric truck is an amazing concept. 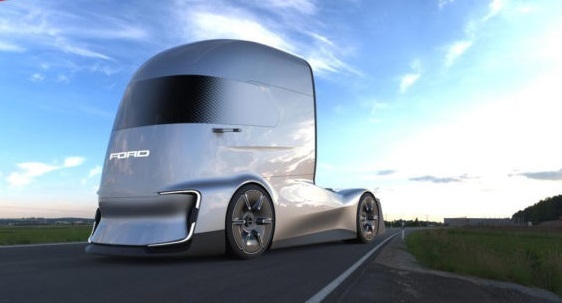 With an electric motor, this concept truck has a level 4 semi-autonomous system. Of course this truck will be easy to use even if you have to drive alone. He said this truck has components that are quite light and feature an "interactive front end". Still confusing about other systems and features, but certainly according to Ford, the design of this truck is an inspiration from a famous figure. The inspiration came from a Marvel superhero, Iron Man. Yes, if you look at it, the front can be said to resemble an Iron Man helmet. The Ford F-Vision Concept itself will be a serious challenge for some other electric-powered autonomous trucks, such as the Tesla Semi for example. Looks like the Ford F-Vision Concept will be more similar to Iron Man if it is cast in red gold and driven by Tony Stark, guys? But, Tony Stark's time drove the truck? Ha ha ha. So, what do you think? Tell in the comments column! 0 Response to "Electric Trucks Ford F-Vision: Inspired by Iron Man?"